White rot is a worldwide problem in allium production, and has resurfaced in the New York garlic industry after a long period of eradication. Positive samples were collected in 2016 from the Hudson Valley, Central and Western New York, indicating that the disease is widespread. 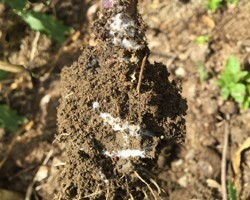 As with other soilborne diseases, white rot can be persistent and devastating. However, careful management can reduce inoculum, and because the disease is spread by seed and soil, it is also possible to prevent its spread into uninfested ﬁelds. Learn more about white rot, the disease cycle, how to identify the disease, and control measures in a factsheet produced by Crystal Stewart, CCE Eastern NY Commercial Horticulture Program, and Frank Hay, Department of Integrated Plant Sciences, NYS Agricultural Experiment Station.